The Updated RX model range makes its world debut at the 2012 Geneva Motor Show. The Updated RX exterior features a new, more elegant and aggressive frontal design. An enhanced interior offers an expanded choice of colour schemes, new trim finishes, a new steering wheel, a revised instrument binnacle and a second generation Remote Touch Interface (RTI). The versatility of the RX 450h’s Lexus Hybrid Drive system has been enhanced by the addition of a Sport Mode, supplementing the full hybrid powertrain’s Normal, Eco and EV (Electric only) drive modes. The EV mode can now be activated with a separate switch. 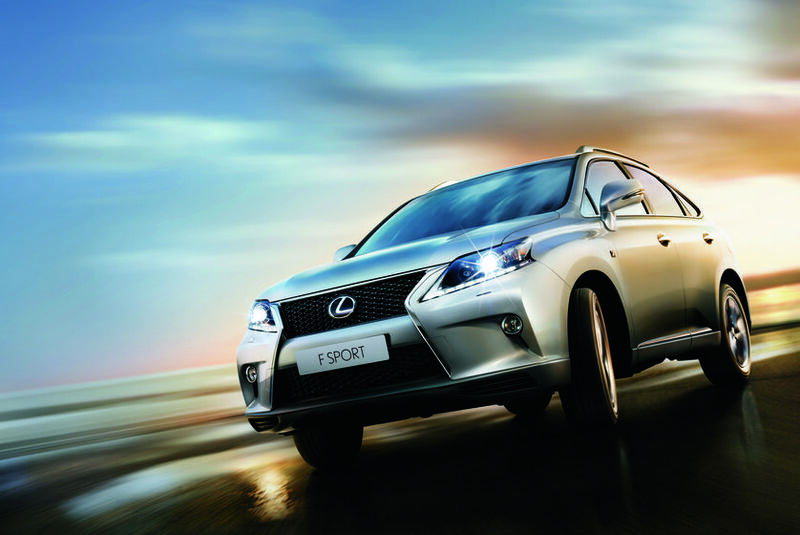 Further enhancing the dynamic and sporting character of the updated RX and designed to attract new customers to the model range, a new F SPORT version will be available. The new F SPORT grade features bespoke exterior and interior design and driving dynamics technology. With the launch of the first RX in 1998, Lexus created the Luxury SUV segment, combining, for the first time, all the flexibility, practicality and durability of a Sports Utility Vehicle with the handling, performance, refinement and ride of a luxury sedan. The RX was the first SUV to be equipped with a full hybrid powertrain in 2005. Today, after three generations, two of which have been equipped with Lexus Hybrid Drive technology, the RX remains a key model for Lexus. 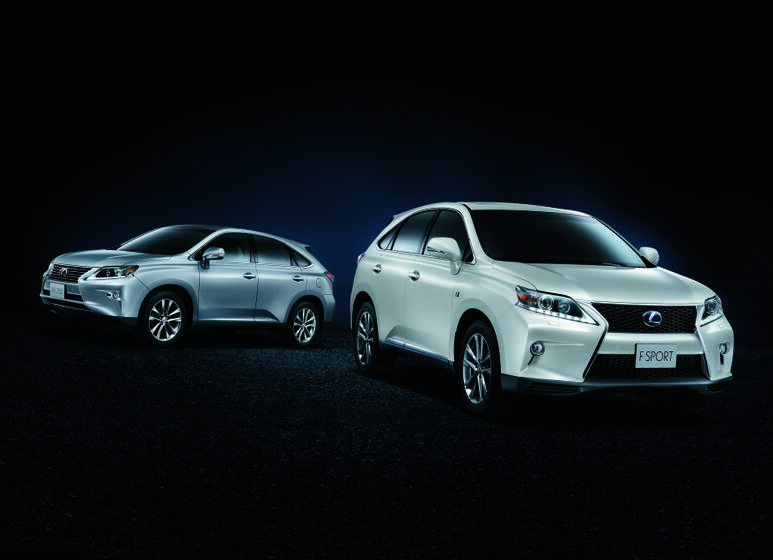 The updated Lexus RX range is hallmarked by a bold, elegant and highly individual frontal treatment which will be adopted throughout the brand to strengthen the Lexus family identity between model ranges. Giving the updated RX a powerful, commanding road presence, this new, more aggressive design is a further evolution of a styling cue first developed on the CT 200h and GS model ranges. The inverted trapezoid upper grille and slanted lower grille have been combined and integrated into a single element, bridging the bumper mid-section to create a prominent ‘spindle’ shape. Reinforcing this more modern and bolder identity, the lower grille now features horizontal bars and finished in black. Positioned on a higher plane than the grille itself –a unique Lexus characteristic- a new, clear lens headlamp cluster design incorporates a choice of halogen, High Intensity Discharge (HID) or Light Emitting Diode (LED) headlamps. The headlamps are underscored by integral LED Daytime Running Lights (DRL) which form the L-finesse arrowhead motif, reinforcing the unique visual signature of the updated RX model range. Now also fitted with clear lenses, the rear lamp clusters have also been redesigned with a stronger, more sweeping horizontal emphasis, adding elegance to the rear of the vehicle. The current choice of 18” or 19” aluminium wheels is expanded by the addition of a new 19” alloy wheel design, and three new exterior colours are available – Silver Lining Metallic, Fire Agate Pearl, and Deep Sea Mica, bringing the choice of colours available to 7 in total. Further broadening the appeal of its spacious, luxurious and technically advanced dual-zone ‘crossover’ cockpit, the updated RX interior features an expanded choice of colour schemes, new trim finishes, a new steering wheel, a revised instrument binnacle and a second generation Remote Touch Interface (RTI). Adding to the choice of interior colour schemes available, Saddle Tan, and F SPORT-exclusive Black and White-Grey designs join the existing Parchment, Black and Light Grey line-up. The choice of trim inserts has also increased; luxurious Espresso and classic Dark Grey complimented by the addition of modern, Black bird’s eye maple and F SPORT-exclusive Silver finishes. Clearly differentiating it from the smooth leather finish, the semi-aniline leather upholstery now incorporates diamond shaped perforations. Seat stitching has been enhanced by the use of thicker thread and more prominent colours, and the dashboard design enlivened through the addition of a matte silver insert above the glovebox. A new, more comfortable steering wheel features a cross-section which is no longer uniform throughout its circumference. Its varying profile allows for a relaxing grip and smooth steering inputs. Wood finish steering wheels are now available with heated rims. The driver’s instrument binnacle of RX 450h versions is equipped with a new Hybrid System Indicator design featuring clearly delineated, Charge, Eco and Power zones. New ambient illumination changes according to both driving conditions and the selected drive mode. In EV (Electric only), Eco or Normal drive modes, when the Hybrid System Indicator needle is in the Charge or Eco zones, the ambient illumination is blue. It will extinguish if the needle enters the Power zone. 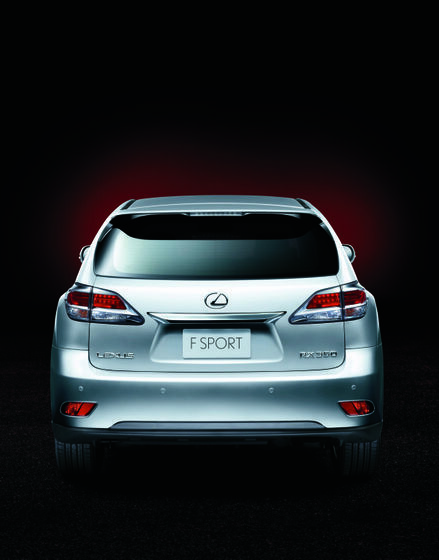 In Sport mode, the ambient illumination remains red at all times. The centre console box has been extensively revised to enhance its practicality. The console lid opening angle has been increased to 95 degrees to improve access. Both the USB port and accessory socket have been moved closer to the top of the box interior, which now features a closable door and a removable divider plate. The updated RX model range is equipped with a second generation Remote Touch Interface (RTI). This Lexus-unique, multi-function control device has been enhanced for increased user-friendliness and ease of operation. It now features the world’s first slide-type joystick mechanism which functions much like a computer mouse, and the ENTER command is now accomplished simply by pushing the controller. In conjunction with enhanced RTI control, the multimedia system’s full colour LED display now has multi-screen capability. This allows for the permanent display -and independent control- of three types of information simultaneously, such as map, vehicle information, audio, navigation input, air conditioner functions and incoming call. 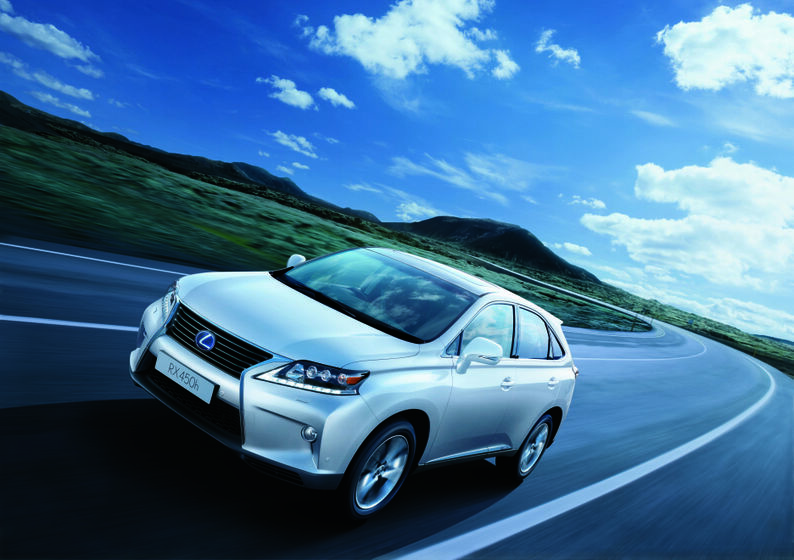 Supplementing the Normal, and Eco drive modes of the full hybrid powertrain’s E-CVT intelligent electronic transmission, a new Sport mode further improves the performance and dynamic ability of the RX 450h. These three drive modes can be selected through the steering wheel, whilst the EV mode (electric only) can be now activated through a separate EV switch. From start-up and at speeds of less than 50 km/h the RX 450h automatically operates in EV mode, driving under electric motor power alone. The driver may also select EV mode manually. 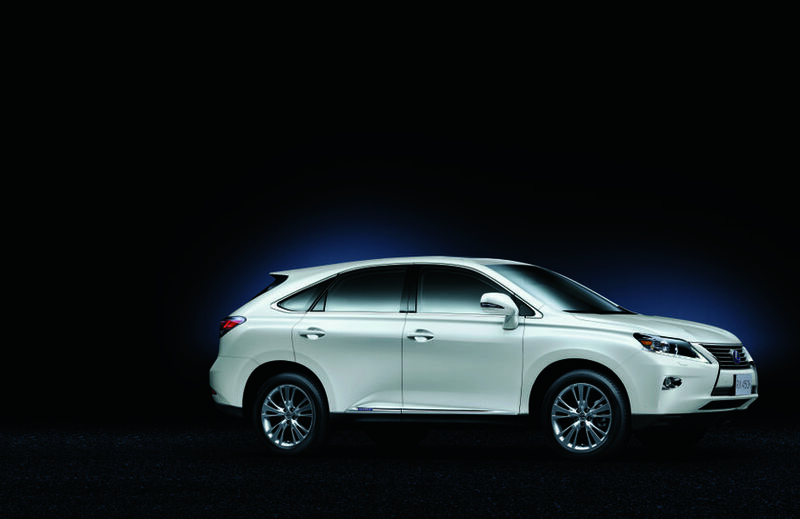 This unique driving mode is only available through the full hybrid technology of Lexus Hybrid Drive. The EV drive mode allows for relaxing urban driving with minimal noise, and zero CO2, NOx and particulate emissions, for up to two kilometres. Because the petrol engine is switched off throughout its operation, the EV drive mode contributes to a significant reduction in the new Lexus’ overall fuel consumption. In Eco mode, throttle response to aggressive accelerator pedal inputs is reduced and air-conditioning control optimized for improved fuel economy. Depending on driving conditions, the Eco mode can help customers adopt a relaxed driving style, and can achieve a perceptible reduction in fuel consumption. 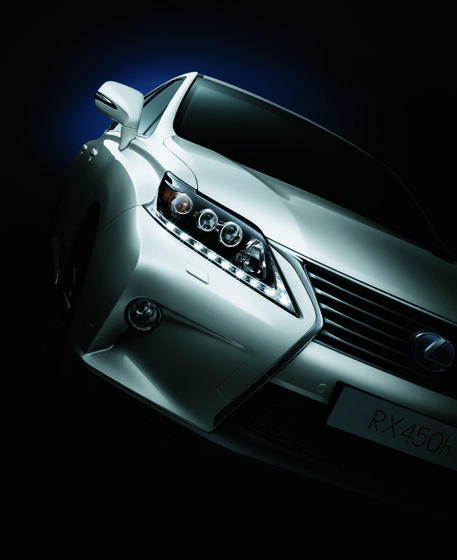 Specifically tuned to deliver greater electric motor power, Sport mode maximises the updated RX 450h’s performance and agility. It not only modifies the throttle and Electric Power Steering (EPS) settings to give a faster response to driver inputs, but also provides less intrusive operation of the Vehicle Stability Control (VSC) and Traction Control (TRC) systems, allowing drivers to fully exploit the Lexus full hybrid’s extended dynamic abilities. The distinct character of each drive mode is further reinforced through changes to the driver’s instruments. Lit in hybrid blue for the EV, Eco and Normal drive modes, the instrument panel ambient illumination automatically alters to red when the Sport mode is selected. 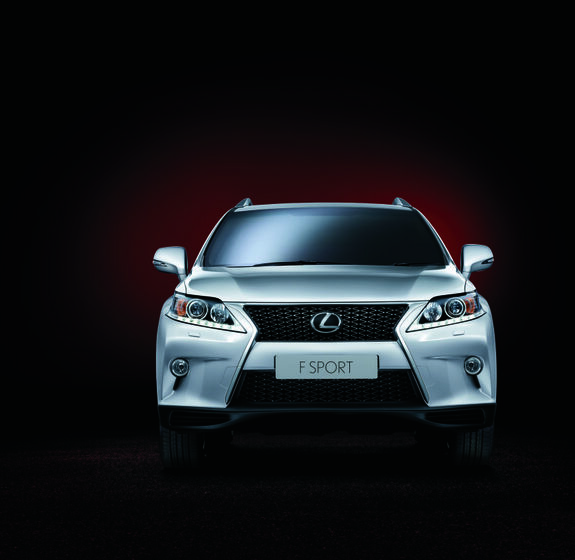 Further enhancing the dynamic and sporting character of the updated RX and attracting new customers to the model range, a new F SPORT version is now available. The new F SPORT grade features bespoke exterior and interior design and driving dynamics technology. F SPORT versions of the updated RX are instantly identifiable by significantly more aggressive, model-unique frontal styling. A deeper, more vertical front bumper incorporates a bigger lower section of the Lexus family ‘spindle’ grille design. Incorporating a full-width, aerodynamic spoiler for improved high speed stability, the lower bumper’s flared extremities house deeply rebated fog lamps. Both upper and lower grilles feature a F SPORT-specific mesh design. In profile, F SPORT models may be identified by exclusive, 19” shaded alloy wheels and front wing F SPORT badging. 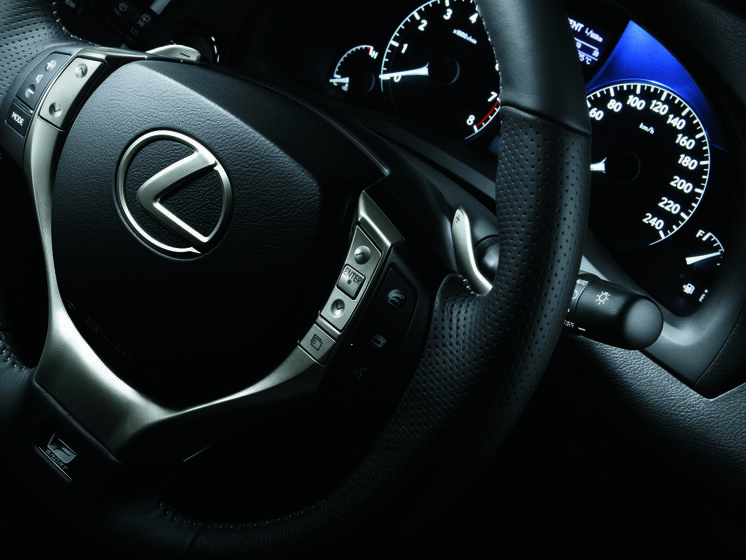 The F SPORT-exclusive interior is hallmarked by an exclusive, Black and White-Grey colour scheme. It features black, smooth leather upholstery with white-grey perforations and contrast stitching, steel silver painted trim inserts and a black headliner to give the interior a more cockpit-like feel and aid driver concentration. F SPORT models further benefit from the lateral performance damper system, which is designed to absorb and minimise undesirable body vibrations, offer a more linear steering feel and contribute to improved ride comfort. In lieu of conventional fixed bracing, the system features a front performance damper connecting the left and right front suspension towers, and a rear damper connecting the left and right sides of the rear lower back panel. With a construction similar to that of a typical monotube suspension damper, the front and rear performance damper assemblies differ according to the variations in body rigidity, noise and vibration of their surroundings, optimising their ability to absorb body torsion, flexure and fine vibrations. Their installation has reduced vehicle floor vibrations across a wide frequency range, reduced body deformation through a drop in left and right front suspension tower displacement, and even lowered audio system white noise levels. Though difficult to analyse even using Computer Aided Design, micron-sized, minuscule vibrations manifest themselves as a slight discomfort when turning the wheel and minute deviations in vehicle behaviour during straight line acceleration. Their elimination brings a new dimension of steering response, agility and ride comfort to the premium SUV segment. The 8-speed automatic transmission of the RX 350 F SPORT version is now equipped with a steering wheel-mounted paddle shift control. The paddle switches can be used even with the gear selector in D range, allowing the driver to quickly change to fixed range mode without the need to engage S range via the gear lever. 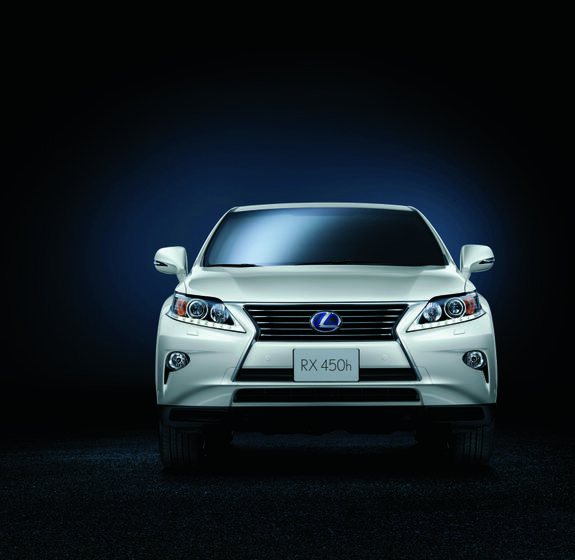 The updated RX will be available with a choice of two powertrains: the hybrid RX 450h, RX 350.